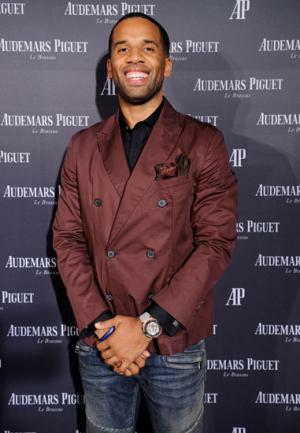 Maverick Carter was born in 1980, in North Akron, Ohio, USA. He is a manager, businessman, and producer perhaps best known for his relationship to National Basketball Association (NBA) star LeBron James. He is the CEO of the management firm responsible for promotions, marketing and the publicity of James. All of his efforts have helped put his net worth to where it is today. How rich is Maverick Carter? As of mid-2016, sources inform us of a net worth that is at $15 million, mostly earned through his current management endeavors. Aside from handling Lebron’s public life and other deals, he also handles collaborations and has produced a few television shows and movies. All of these have ensured his increasing wealth. Carter started becoming well known after Lebron told the media that he was his close friend and confidant. According to reports, they’ve been friends since childhood and this has helped their current working relationship. It all began in 2005, when James fired agent Aaron Goodwin and formed LRMR Innovative Marketing and Branding with Carter. Prior to forming the company, Maverick had worked for two years with Nike and was starting to get recognition due to becoming a CEO at the young age of 24. For the majority of James’ career, Maverick has worked as a manager, helping the player decide on various things such as Lebron’s team switches. Carter became instrumental in James’ switch to Miami and his eventual return to the Cleveland Cavaliers. As the CEO, he helps and advises Lebron on investments and deals as well as helps James with ensuring that his reputation is good. He’s helped Lebron get sponsorship deals from various companies such as State Farm and McDonalds. Carter’s also helped with productions and deals with networks such as Starz and ESPN. Reports say that he has been instrumental in helping James’ earn around $43 million in just one year, including his salary in the NBA. While many people believe that Carter is Lebron’s agent, reports have stated otherwise. According to an interview, Lebron’s return to Miami was more of his personal decision rather than a consultation from Carter. He helps but ultimately it is the player’s decision on what they should do with their life. He’s also given praise to the Miami Heat organization and especially the players who have integrity and are respectful. He’s also started working with other basketball talents such as Johnny Flynn and Chris Paul. Maverick is also known to be friends with quarterback Johnny Manziel and is believed to have already started working on his business affairs and career. He’s also started diversifying and has worked on branding and consulting deals with other companies including American Signature and Steuben Glass. According to a few sources, Carter’s group and company gained a bit of notoriety after surrounding a woman named Vaneisha Robinson. The woman had bought a five dollar pendant in a garage sale which was from Carter. The pendant turned out to be worth $10,000 and it caused Carter’s group to surround her and force her to give the pendant back. For his personal life, not much is known about his family and current relationships. He’s said to be friends with many basketball players, especially as he spent a lot of time with James’ teammates.